Learn to solder and learn to make cool things with electronics. 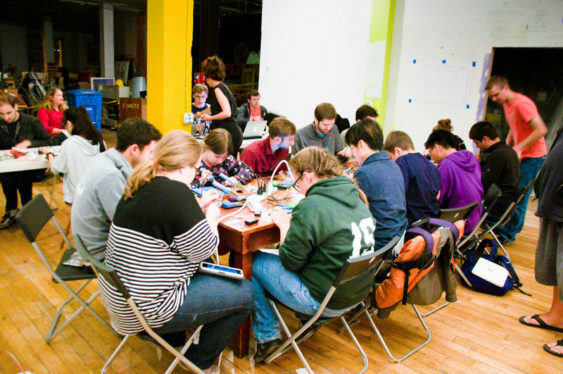 Hang out with cool hardware geeks at Noisebridge’s weekly Circuit Hacking Monday. All ages, all skill levels, and all are welcome at this weekly Monday night event to give you inspiration to hack that project you’ve always wanted to work on. The goal is to make a project tonight and bring it home with you. Bring your own project for free, or there are plenty of cool kits available to make. Instruction is free. They ask that people pay only for the cost of the parts used — kit prices range from $10 to $35. The weekly Circuit Hacking Monday event is free and open to the public, but if you become a regular, you should probably consider donating. Noisebridge is a space open to anyone interested in the creative uses of technology. You and anyone else are free to use the space and most of its contents at any time; just ring the doorbell at 2169 Mission Street to come in. Noisebridge is solely supported by individual donations by its users. You can donate through PayPal on their site or in the donation bins across the space. If you use Noisebridge regularly, set up a regular donation. A $10-$40 monthly subscription is a great way to ensure Noisebridge stays around. Updated 2/27/19 – Event info last checked via website.